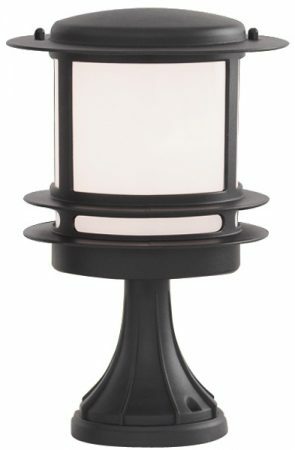 This modern, simple and attractive Stroud small black finish IP44 outdoor post top light with opal polycarbonate diffuser creates an excellence source of light for any of your outdoor areas. The lamp is splash proof IP44 rated to protect against the weather on any drive, pathway or garden. A short black finish post top light that is rated IP44 and suitable for outside use. Constructed from chromate treated cast aluminium, with a tapered stem and large vandal resistant polycarbonate light diffuser. This short post lamp is only 360mm (14 inches) high making it ideal for lower walls around a patio for example or dwarf walls alongside a driveway. This outdoor light takes a 60w lamp so it will be very bright. It is also suitable for use with an 11w low energy light bulb.